I’ve been running in the mornings with my husband, and I’m trying something new. I’m trying not to breathe through my mouth. I’m trying not to breathe through my mouth. In fact, I’m attempting to sustain my morning runs breathing in and out through my nose and my nose alone. Specifically, I’m utilizing a style of nasal breathing called ujjayi pranayama or ‘victorious breathing’, a slow and controlled style of yogic breathing which produces oceanic (or Darth Vader-like) sounds due to a slight constriction of the throat. Why? Well, it’s an experiment. It’s based on some research I heard about, research conducted by Ayurvedic physician Dr. John Douillard in his book Body, Mind & Sport: the Mind Body Guide to Lifelong Fitness and Your Personal Best. 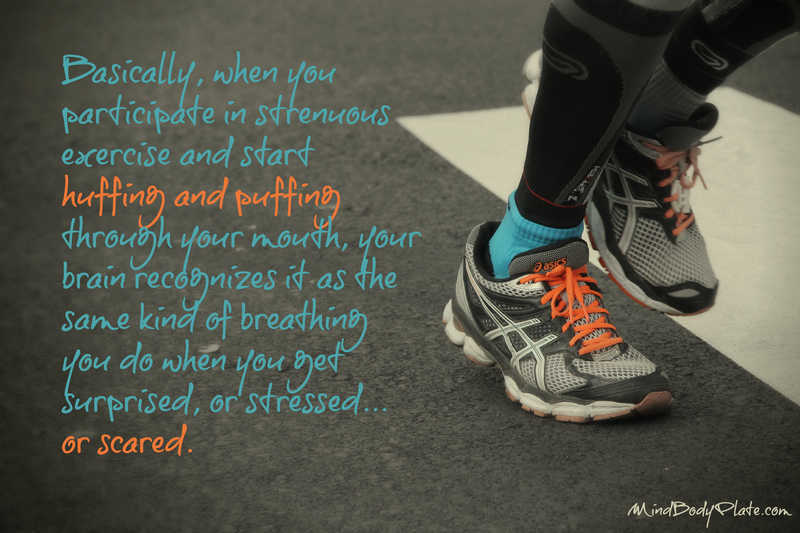 Basically, when you participate in strenuous exercise and start huffing and puffing through your mouth, your brain recognizes it as the same kind of breathing you do when you get surprised, or stressed… or scared. And it registers that you might just have a reason to be stressed or scared. 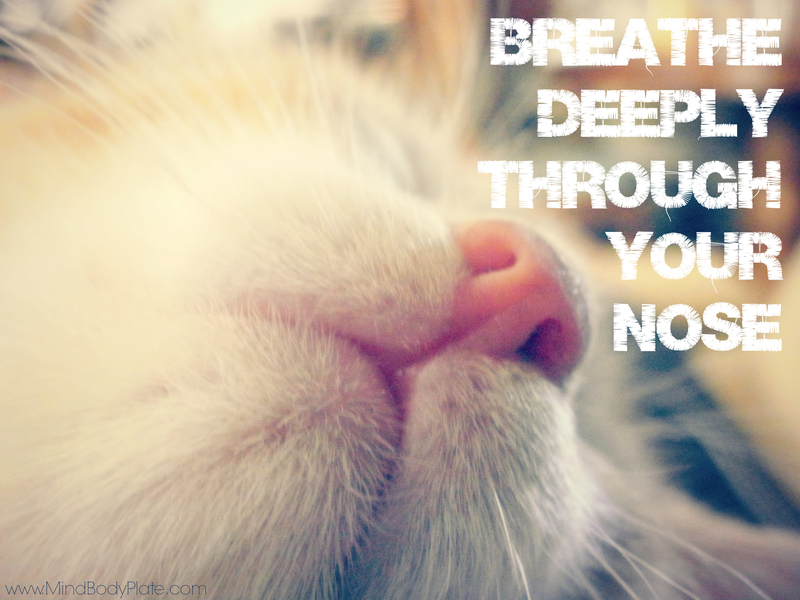 Nasal breathing, on the other hand, allows for deeper diaphragmatic breathing, which stimulates the vagus nerve, which stimulates the parasympathetic nervous system — in other words, breathing through your nose makes you feel less stressed. It lowers cortisol levels. It sets you up for ‘rest and digest’. And I want the very act of running to feel relaxing to me. I never want running to feel any more strenuous than a few sun salutations. I don’t want any small part of my subconscious to think that there’s something wrong when I hit the pavement at 6:45 AM every morning, that I’m running from something, that there’s an emergency. Because ultimately I think that will sabotage my goals. In some small way, I think it will set my mind against doing it. When I was a kid, and let’s face it, pretty much up until the age of 25 or so, I hated running. And it wasn’t just because my cheeks turned a particularly Irish shade of beet red when I exerted myself. It was because it felt awful. And I think it felt awful because it was something I just didn’t do on a regular basis. I rarely ran for fun, let alone for relaxation, and then all of a sudden, my PE teacher would bark out orders to run a mile, and my body was like, exsqueeze me? So infrequently was I asked to run, that whenever I did it felt like torture. My body wasn’t prepared for it, so it felt like death. And the more I came to associate running with, you know, feeling like death, the more my distaste for it grew. I’m trying to rewire that distaste. I won’t settle for just feeling proud because I pushed myself to run and I did — I want to want to run, because it feels good. I want every cell of my body to feel joyous when I run, so for now I’m breathing through my nose. 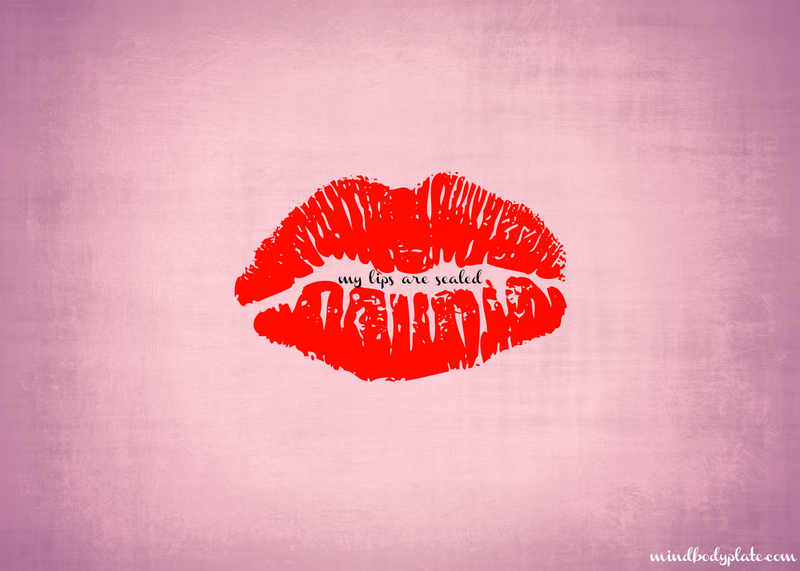 Now I can’t run as far or as fast when I keep my lips sealed, but I know that’s not permanent. My endurance will get stronger and stronger. Two years ago I ran a 10k, achieving something I never thought I would or could do, and it was a very proud moment for me. My next goal is to run a 10k while breathing through my nose. So if you’re not a runner, or even an aspiring runner (which is okay, by the way), how does this all apply to you? Start paying attention to the way you’re breathing when you engage in any kind of activity. Even just walking to the car or the subway. If you find that you’re taking shallow, non-diaphragmatic breaths, or even holding your breath, you’re not alone; it’s pretty common. Spend some time thinking about the subconscious messages that kind of breath could be sending to your brain. Imagine the deep, slow, relaxed and luxurious breaths you take when you’re, I dunno… getting a massage. What would it be like to breathe like that throughout the day? Or while you were exercising? I’m interested to hear from my more experienced runner friends. Do you have a pattern of breathing or an approach to breathing that makes your experience more enjoyable or otherwise fruitful? Can’t wait to hear about what works for you!